This is the special trip combined between James Bond Island and Snorkeling Island - Koh Khai. Within one day, you can do a great snorkeling on the beautiful island - Khai Island and sightseeing by Snorkeling at James Bond Island in Hong Area. 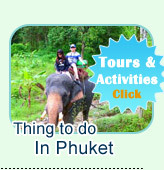 All in all 3 the most reputation tourism places phuket you can see as the following pictures and details. James Bond Island: Sightseeing at the Movie Place. James Bond Island and Leaning Rock Island (Khow Ping Kan) is the most strange beautiful point of Phang Nga Bay. The movie James Bond 007 make the world class film here. 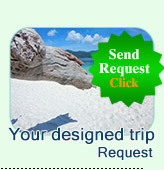 We will visit James Bond Rock, Leaning Rocks, Sea Shell Beach and Complicated Caves on the Island. The signature point: Hongs Island. Hong Island: World class place for sea canoeing, we prepared the canoe for everyone to discovery the difference sea limestone caves and beautiful Mangrove Safari as well as the wildlife in the area. We guarantee that this is the best point for canoeing of Thailand. Khai Island, Greatest place for shallow Snorkeling. Khai Island is the place for snorkeling. It can be the heaven of both the adults or children because of the snorkeling can just start from the beach. Very easy and the best for every one. Especially, you can play with a millions of fishes just on the beach. This floating village is on the "Panyee Island" The world class place for the tourist must see. The village is floating on the sea water as well as the football stadium or school. We visit the local life of the real away islanders and having lunch on this floating village. 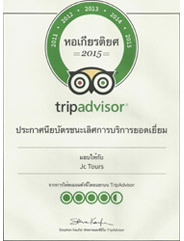 07:00 AM: The minibus picks up from every hotel in Phuket Island to the Private Zone of Jc.Tour in Royal Marina. 08:30 AM: At the pier, we served hot tea or coffee and soft supper before start. In the mean time, our tour guide brief the program ans set up the sun block cream and fit the snorkeling marks. 09:00 AM: The speed boat leave from the Pier, directly to Phang Nga Bay. The boat cruise on the way passing the beautiful point with a hundread of difference strange shape montain islands. 10:40 AM: We arrival the Panak Island, The speed boat cruise slowly to see the beautiful 1000 years of Limestone cave (The boat can run through in the cave.) We sightseeing into the lagoon which is hidden in the mountain. Arrival James Bond Island: The boat stop on the island, and we walk up into the seashell beach and climb up to see the complicated limestone cave on the Island. As well as stop on the beach seeing the James Bond 007 Rocks. And continue to see the Leaning Mountain. All the places were concerned the movie 007 James Bond. 11:30 AM: The speed boat leaves and cruise into the The Muslim Village on the sea "Kuan Kha Village" and visit the Through Cave and the 500 years pictures those written by Animal Blood. 12:30 PM: We stop for lunch on Pan-Yee Island. The village, Football stadium, the school, the mosque, the souvenir shops and the restaurants are floating on the sea. 13:30 PM: Leave from Pan Yee Island directly to Hong (Rooms) Island - The best place for sea canoeing of Thailand. 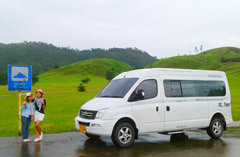 We visit the several beautiful limestone cave as well as the mangrove safari. 14:30 PM: The speed boat run fast at the high speed directly to Khai Island for snorkeling and relaxing on the white sandy beach. Nice swimming, Snorkeling and relaxing on the beach. 16:30 PM: The speed boat leave from Khai (Eggs) Island to the Pier. 17:00 PM: Arrival The Royal Marina Pier, the same minibus picks up and transfer back to the hotel. All entrance fee to every Program places.